In the early eighties, a number of bands cemented their reputation because they were there at the right time and the subject matter of their current tracks resonated with the British public. The Beat were calling for Margaret Thatcher to resign with their hit Stand Down Margaret, The Specials highlighted the 1981 UK riots in London, Liverpool and Glasgow in their number one Ghost Town and UB40 landed in 1980 with their double A-sided hit Food For Thought and King which were written about events further afield, namely world poverty and Martin Luther King respectively. Hailing from Birmingham, the most successful, predominately white, reggae band comprised lead singer Ali Campbell and his guitarist brother Robin, bassist Earl Falconer, keyboardist Mickey Virtue, vocals and trumpeter Astro, saxophonist Brian Travers, trombonist Norman Hassan and drummer Jimmy Brown. They all knew each other from various schools around Birmingham and in February 1976 whilst the boys were out celebrating Ali Campbell’s 17th birthday a fight broke out and a number of people, including Ali were glassed. Eventually, a couple of years later, he received £4000 from the criminal compensation board, which Robin had applied for and that enabled them to buy instruments to properly form a band. Apart from three of the members, the rest had been claiming unemployment benefit, so when they formed they took their name from the Unemployment Benefit form number 40. In mid-1979 Chrissie Hynde spotted them in a pub and invited them to join her as a support band for her forthcoming tour. They accepted and in March 1980 released their debut single. John Peel gave them their first break and Peter Powell began championing them on his Radio One show too. Despite being a double A side, it was Food For Thought that radio stations preferred and they signed to a small label called Dep International and was the first single to reach the Top 10 without a major record company behind it. In 1985 they repaid the favour by inviting Chrissie Hynde to join them in a cover duet of I Got You Babe, which topped the UK chart. 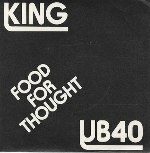 Food for Thought was predominantly the creation of Robin Campbell, “I actually wrote Food For Thought in my flat in Birmingham, just before Christmas one year… so it’s actually a Christmas song! Or rather, it’s inspired by the hypocrisy of Christmas, then I brought them to the band and we sat around and worked it to music. That’s usually how it works. The fact that there are starving people in Africa and here we are all sat around eating our Christmas dinner and praising the Lord. People are still dying every day, every minute while we’re doing it, but people tend to forget that because it came out as a single in April. It was our debut single: we had a record deal but the label weren’t in any hurry to release anything, and then we went on tour with The Pretenders who had the number one single and album at the time. Quite often it’s one person that brings a lyric to the band, generally without a melody. As a band we just jam and record stuff that we like, and then it’ll be like okay, we’ve now got 25 backing tracks, we’ve got to come up with some lyrics! And we go away and come back with a bunch of ’em and select the ones we like between us. Ali was the tunesmith: he would take the lyrics and fit them to an instrumental that we’d already come up with. That was our songwriting routine… pretty arse-backwards really compared to other people!” It was basically a dig at politicians who refused to relieve famine. The opening lyric is often confusing, at the time the common thought was that Ali was singing ‘I Believe in Donna’ whereas the actual lyric is ‘Ivory Madonna’ and in the second line he sings ‘Waiting for the manna coming from the west’ Manna was the supernatural food God gave to the Israelites during their 40-year wandering in the desert and thus in the meaning of this song, it means waiting for the countries of western Europe to deliver food to the starving millions.